During the fiscal year ended September 30, 2014, the volume of United States Mint circulating coin shipments to Federal Reserve Banks rose by 21.9% to more than 13 billion coins. This marked the fifth consecutive annual increase in circulating coin shipments. The value of the shipment for the latest fiscal year was $783 million against a gross cost of $493.9 million, resulting in seigniorage of $289.1 million. The United States Mint produces and issues circulating coins to the Federal Reserve Banks in the quantities needed to support their service to commercial banks and financial institutions. The banks and financial institutions distribute the coins to meet the demand of retailers and the public. The Mint recognizes revenue from the sale of circulating coins at face value when they are shipped to Federal Reserve Banks. The difference between the face value of the coins and the cost to produce and manufacture the coins represents seigniorage. The Mint transfers seigniorage to the Treasury General Fund to help finance national debt. The unit volume of cents, nickels, dimes, and quarters shipped to Federal Reserve Banks all rose during the 2014 fiscal year. The cent accounted for the greatest unit volume of shipments at more than 7.9 billion pieces, which accounted for 60.8% of all circulating coin shipments. For the second year in a row, the quarter dollar denomination saw the largest increase in production volume, increasing by 58.5% compared to the prior year. Since the 2012 fiscal year, the production volume of quarters has more than tripled. Following the Treasury Department decision of December 2011, the $1 coin is no longer produced and distributed for circulation. 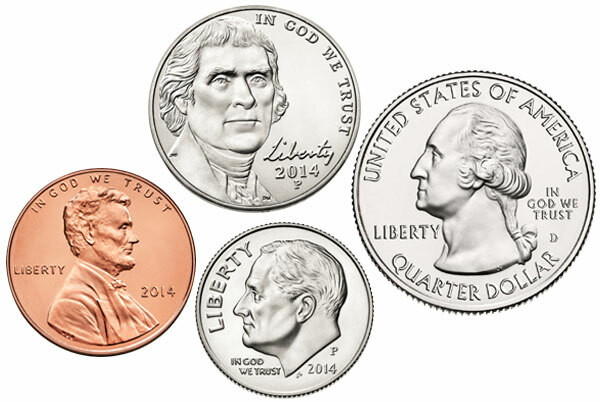 The United States Mint still produces the $1 coins in limited numbers to fulfilled demand from collectors. Since these coins are only distributed in numismatic products, the production $1 coins is reported under the numismatic segment. The unit costs for producing each denomination declined compared to the prior year. The declines were driven by higher production volumes, which served to split fixed costs over more units, as well as lower metal prices for certain denominations. During the year the average spot price for copper fell by 6.9%. Copper is the primary metal component in the nickel, dime, and quarter. Average spot prices for nickel and zinc rose by 3.9% and 8.4%, respectively. Nickel is a metal component of the nickel, dime, and quarter. Zinc is the primary metal component of the cent. The unit cost to produce and distribute the cent and nickel remained above their respective face values at 1.66 cents per cent and 8.09 cents per nickel. The cost of the two lowest denominations has remained above their respective face values since 2006. During the 2014 fiscal year, the cent and nickel generated negative seigniorage of $52.9 million and $47.6 million, respectively. These losses were offset by the seigniorage generated from the dime and quarter. Across all denominations, circulating coins produced by the United States Mint generated seigniorage of $298.1 million. This amount was up by 110.4% compared to the prior year total of $137.4 million. The United States Mint made a non-budget transfer of $250 million in seigniorage to the Treasury General Fund during the 2014 fiscal year.